The Grand Canyon has always been a magnet for innovation. 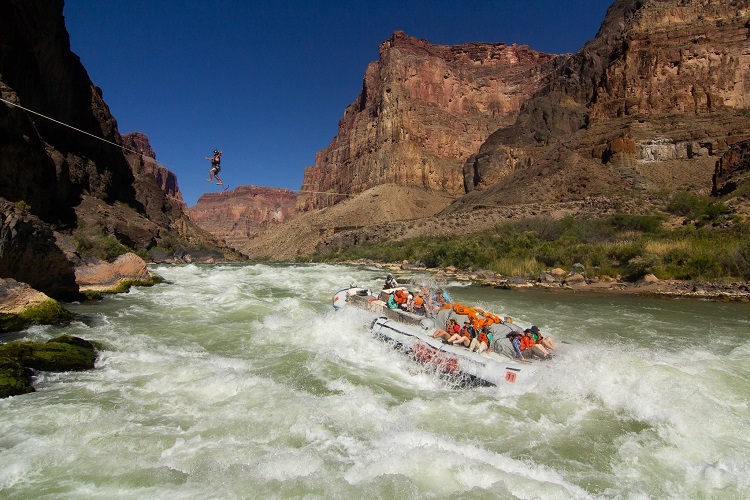 After John Wesley Powell proved what could be done, the Canyon has seen adventurous people up the challenge in their own unique ways. From racing for the fastest completion time to completing the canyon upstream via jet boat to two people who swam the entire Canyon in 1955. Great places attract great challenges and our adventure grew from a similar root. Two months before we rigged our rafts and pushed off the shore at Lee’s Ferry I got a call from Mickey Wilson. Mickey was a new friend I had met when I moved to Colorado a few months earlier and he explained that his wife, Purple, had won a late lottery permit and planned to do something that had never been done before: slackline the canyon. I was in. Mickey is a professional athlete and a pioneer in the sport of slacklining. As a relatively new sport, he has been there since the beginning and pushed the sport in many ways. Also being a whitewater kayaker, Mickey had been down the Grand twice before this trip and had always imagined returning with slackline gear to put up lines in places that had never been done before. Slackliner’s call these new lines FS’s, first sends. 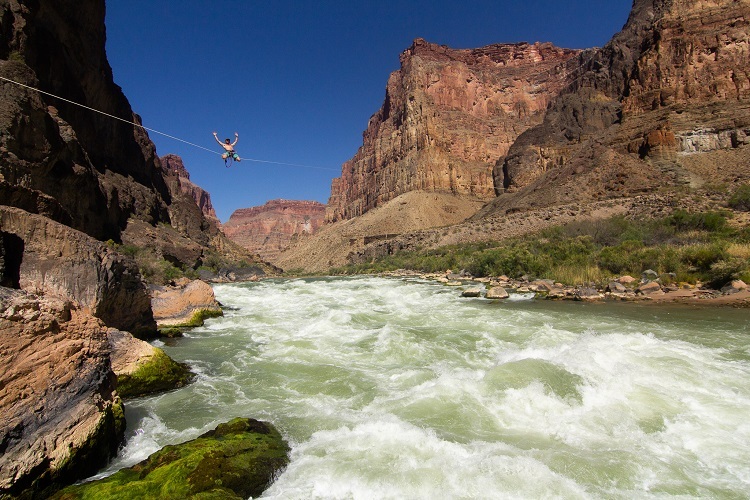 With a 1,000-foot piece of Vectran webbing, the same webbing used to attach astronauts to the space station, we set off down the canyon in search of epic spots to set up lines over the river. Our trip was action packed. 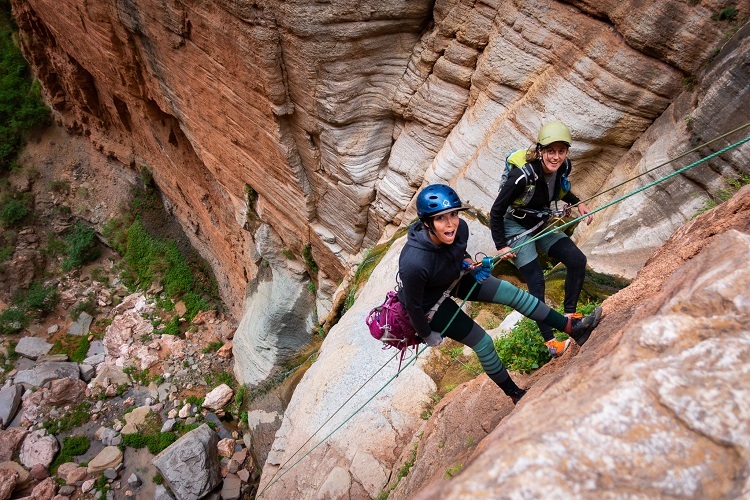 In addition to paddling the 226 miles, searching for and rigging slacklines, we also managed to pack in a ton of canyoneering. It was an adventurous crew of 8 and we made the most of every minute. We found slackline success in 3 epic spots. 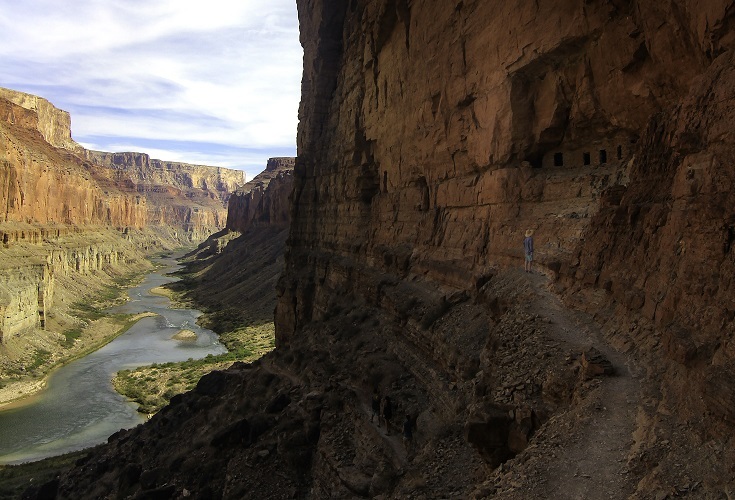 Our first line was in Marble Canyon on day two. At 200 feet long and 40 feet off the water, Mickey made the walk look like a piece of cake before jumping off the line into the emerald water below. It was a perfect test run for what would come downstream. Line two was in one of the most iconic and beautiful spots in the canyon, Keyhole. If you’ve seen a postcard of the Grand Canyon from water level, it’s likely that it is from this spot. Rigging this line proved to be a challenge and quite a learning experience. While the water at this particular point on the Colorado was calm and slow moving, if you try to drag a piece of one-inch webbing across a 200 foot section of river, you will not be successful. With 8 people pulling as hard as we could, we couldn’t even get the line to budge. Perfecting our technique, on the second try we were able to lead the webbing by ferrying parachute cord across the river first. Once set up, the Keyhole line was 550 feet across and anchored at least 50 feet above the water. It was backdropped by the iconic Grand Canyon view and was stunning to watch. Mickey was able to cross the line both ways without falling and true to his style, ended with a jump off the line into the water below! The final line was the only line Mickey had preplanned. From the beginning, he had hoped that there would be a suitable set of anchors to place a line directly over the largest rapid on the river, Lava Falls. Lucky for us, there were a set of anchors, but they weren’t perfect. On river right we found two giant boulders creating a choke point about 45 feet above the water. On river left, a tree that required romping through a jungle of sharp, cattail-like plants that cut through your skin with ease. Add to that air temps in the upper 90’s and a brutal, beating sun that burned not only your skin but cooked the rocks to a sizzling degree, and this was by far the most difficult line to set up. 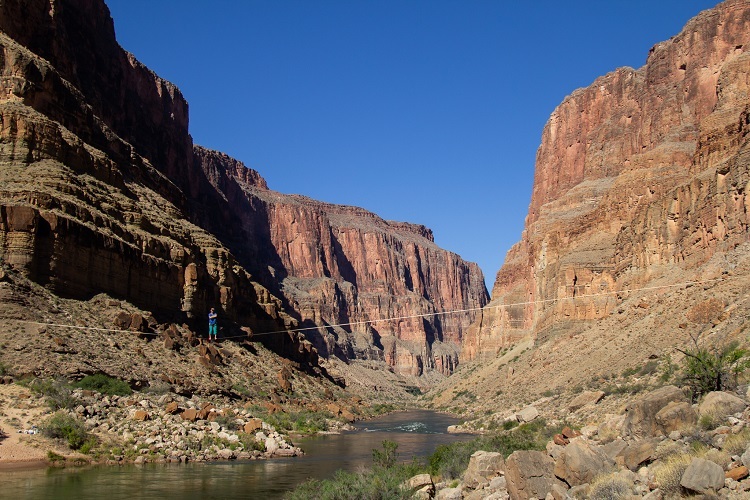 This was it, the iconic Grand Canyon slackline experience we were after. Huge canyon walls towered the line with equally huge raging whitewater below. After completing the walk and doing a handful of tricks as commercial trips passed below, Mickey named the line “Walking on Lava”. Our trip was an amazing adventure through and through. We had accomplished what we set out to do and had unforgettable experiences along the way. As slacklining continues to develop as a sport it will be fun to see if other slackliners attempt a Grand Canyon expedition or ever set up Mickey’s “Walking on Lava” line again. Where will your next adventure be?! Whether you are slacklining, rafting or simply spending a night along the river keep your gear safe and dry with Watershed Drybags. 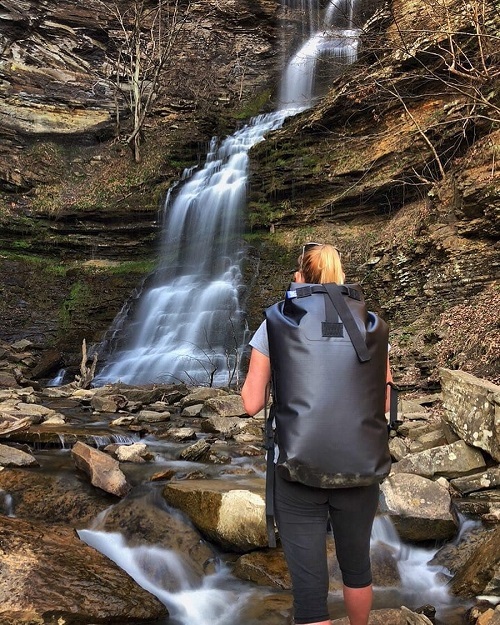 Perfect for a multi-day rafting trip, the Animas backpack has shoulder straps and a removable waist belt for easy carry to and from the raft. A great option if you go off on any hikes throughout the day or need to hike in towards a campsite. Keep overnight items in the Animas and day necessities easily stored in the Ocoee Duffel. The smallest of our popular duffel style submersible bags for good reason!